What does your reading genre say about you? I’ve realized that I tend to read in my genre like someone studying for a degree – I will read throughout all of the other genres of writing in a very broad spectrum; don’t get me wrong, I love reading anything and everything. I’ve realized, however, that when it’s all said and done I end up crawling back to a certain type of books. For me, it’s young adult/adult novels that are centric around paranormal/supernatural romance or young adult/adult fantasy romance. I’ve realize that’s kind of the world that I sink into the most when I write – it’s my genre, and it tends to be the thing that I will really read the most. I don’t think this is a bad thing, however. As writers, we are always looking to broaden our horizons, to expand in our knowledge. We really do need to familiarize ourselves with the market that we intended to strut forth into if we plan on making it. I think my Amazon Wish List kind of tells the tale. It’s like… yeah, there’s other things on there… and then there’s that vampire romance series… I’m working on getting books that I’ve never read before, working on broadening my reading scope, but I do realize that I’m always going to have that special, go to play in my heart for my own writing genre. What about you? A random post that will be shorter before I do a longer post… but I always find it a bigger struggle to really get into writing when the sun is up. I mean, I can do it. I do it all of the time… but it’s just not the same. For me, when I write during the day I usually feel… it’s hard to explain. I feel the walls, I feel the people moving around me. I feel the world up and awake, their words demanding my attention and putting a damper to the flow of words. It’s so much different to write at night. The world sleeps, and I almost feel like I’m literally plucking their dreams from their heads… or better even, I’m the one telling them the story that plays in their minds. I’m the reason they give a little chuckle in their sleep – those are my words. I don’t feel the sun beating down on me with hard and demanding rays… I feel the moonlight wrapping around me and giving me a kind of flight into the night sky. If I find myself stumped, or at a loss for inspiration… I can step outside and see the way that the leaves rustle with the breeze, casting moonlight shadows across the ground. Yeah. Hoot hoot. I’m certainly a night owl. How do you write best? Daine and Numair are thrown together in the first book in a student/teacher relationship. (Of course, she’s much younger at the time!). You watch as their feelings for each other develop in a very normal, natural way. They become friends, they become protective, Numair becomes even more protective. It’s clear that they are each a vulnerability to the other (and are indeed used against each other in a fashion because of that), and then in the last installment of the series the full emotions of love and a relationship spring forth. Even then, there’s a question to it, whether it will work out, whether their age difference is too much. I like it when books don’t force a romantic relationship on the readers, but instead allow it to develop slowly over time. I feel like they did a really good job with that in these books. Now, my second favorite thing about these novels would be the storyline. I honestly think that it’s completely excellent – there wasn’t anything done in these books (In my opinion) that wasn’t needed. The first novel did a fantastic job of introducing all of the major players of the novel, introducing us to the methods of magic that are used throughout the story, and some of the main villains – the Stormwings, mentions of the Emperor, etc. As we proceed into the second novel, we get a better feel for who will cause trouble and who will not; we’re also lead more into that development of relationship thing that I was talking about. 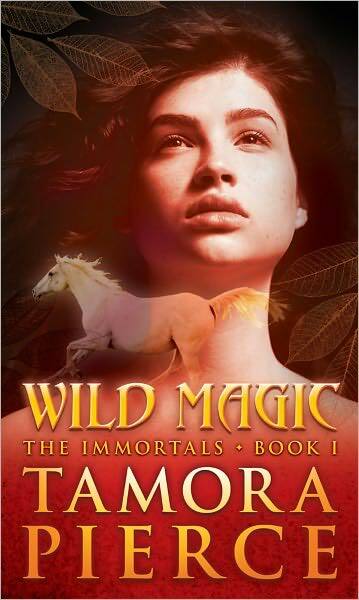 We are already seeing Numair acting protective of Daine’s modesty, and he certainly uses magic that he never would have when her life is in danger. I love the plot and story development, and the way that we are slowly introduced more to the Gods, to Daine’s magic, to the evils of the Emperor. Honestly, the pacing of these books are just perfect. I think that one of my favorite installments of the series would be the third novel. Without trying to give too much away (in case people haven’t read these books), there is a chapter about Daine losing her temper because of something related to Numair – she honestly and completely turns badass and wrecks shop because she thought something could happen to him. The third novel is also my favorite because of a new power/new players introduced into the story. This is where we come head to head with the horrible Emperor everyone has been talking about, and where we see the Graveyard hag, who gives Daine the ability to bring dead things back to life with a touch. This book also gave an extraordinary turning point for some of the characters, including the Stormwing group. It brings about a transformation of one character that will further the plot of the fourth book beautifully. Onward though, I honestly love the writing style and description for these novels as well. I think that Pierce did a great job writing in a way that I could completely adore when I was a teenager and reading these, and really compliment and appreciate now that I’m 24 and doing a reread. Though the writing style isn’t extremely complex, it’s vivid and gorgeously put together, and something I could enjoy no matter what age I was reading it at. Overall, the characters, the plot, the prose and the amazing romance make these books more than worth reading. If you haven’t picked them up, I would do so. 9/10 for these books! Above is a link to my author website. I think that it’s really important to have one of these if you’re really looking to get your books published, whether it be through a publishing house or via self publishing. To an agent, you’re showing the fact that you’re involved in social media, in your book, in making sure that you do well. It’s really important to get yourself out there, whether it is through a blog, twitter, or your website. It’s your storefront, your face, you showing the world who you are and what you have to offer. An agent will see that. Even more important though is if you’re thinking of self publishing. I, personally, do want to try to get an agent, but I may end up also going down the path of self publication if that doesn’t work. Having a website shows the world who I am, again… what I have to offer. It shows them that I am an author who takes herself seriously. Having a clean, professional looking website is a step towards that. It’s one of the same reasons that I run this blog! I like to show the world that I’m here, I’m a real person, and I want to talk, discuss, and share my feelings with you all! If anyone has a link to their website that they’d like to share, I’d love for you to leave it in your comments! Happy writing! Heh, weird post about the blogs that I haven’t quite gotten the chance to write yet. First of all, more ponderings about whether or not I’m going to vlog. I keep bouncing back and forth on it. Thoughts, opinions? And anything else that I read between now and then. Also, i’m planning on doing another about writing/writing advice blog. I can’t wait. :3 Just wanted to throw a little update out there. Also, anything else you guys would like to see? I will totally take requests. Dark Visions, by L.J. Smith Ponderings! So, as opposed to doing these books one at a time, I thought that I would just wait until I finished the trilogy and write up my thoughts on them as a whole. Let me start off by saying that L.J. Smith is one of my favorite authors. Honestly, as a teenager I read The Forbidden Game Trilogy over and over again until I wore my book out. It was fun, after not having read her for a few years to take a step back and read some of her books again. Let me start out by saying that I really do love the plotline of these books. Without ruining anything for anyone (because I know quite a few people probably haven’t read these books, so I won’t be so spoiler-y here). It’s got a great pace, especially if you purchase the 3-in-1 collection so you can sit down and take it all as one bigger book as opposed to 3 much shorter ones. The pacing is done really well. To give you a nice, brief overview of the story…. let’s see. In book one, The Strange Power, we meet our central characters. Kaitlyn Fairchild is a teenager who sees the future via her drawings. She is, of course, beautiful but an outcast amongst her community. She is approached by a woman named Joyce Piper who wants to take her to the Zetes Institution, a place where she can learn to use and control her powers. Of course, she goes (because how fun would the book have been if she’d just said no and stayed home? ), and meets the other characters in our little storyline. Rob, the ‘good guy’ character of the book who is a healer. Anna, her dark haired friend who can communicate with animals, and Lewis, who has PK. And then, of course, there is Gabriel Wolfe. He’s your typical bad boy, but he has such a good story behind his actions. Again, trying not to give away too much here. The Institute is run by a man names Mr. Zetes, whose motives are figured out later to be something not so pure as simply helping them to discover their powers. The events after they find this out and decide to do something about it span over the next two books (The Possessed, The Passion). To sum it up… we have an amazing fight, wonderful romance, betrayal, sabotage and a very spicy love triangle! >_> There, heh. I think that was a good little summary going on here. Honestly, this book is full of enough twists to make it interesting, even if it is a little bit of a generic teenage SP book. The only thing that I wish is that, perhaps, the books had been a little longer so that L.J. Smith could have explored and developed her characters to a fuller extent. I think that’s the trouble with some of the shorter teen books – authors are forced to rush themselves to get to the end of their story without the novel becoming so lengthy that it isn’t appealing to the targeted group anymore. However, there’s enough spice and life in the characters that the book is still wonderful. Maybe it’s just me, a fan of the series, wanting more? The Hunger Games: Catching Fire ponderings. So, I completed the second installment in the Hunger Games novels and I have to say that I wasn’t disappointed in it! I found that the problems that I had with the first novel (catching myself analyzing the writing style) weren’t as evident in this novel. So… to begin my drabblings, I’ll once more do a little move/book comparison. I’ve honestly never seen a novel series that did so well translated into movies. I don’t know what it is, but they really have managed to make sure that they capture the essence of the book in the movie. However, something that I really enjoy that is a complete contrast is the fact that it is all from the POV of Katniss. There is no panning away to see what other people are doing, saying, feeling. It’s just her, her POV, her thoughts, her feelings. We are never jarred out of the world of her emotions, and I love that. It makes me feel so much closer to the character than I would have otherwise, and that’s something that I really enjoy about a novel. Going on from that, I really liked the character development. Perhaps it’s just me, but I always feel like I get to know characters better via books than I ever could through movies. I once more found Peeta such a hearbreakingly wonderful character that I couldn’t help but to love him. He is so earnest in his emotions for Katniss that it is palpable. More than that, the description of how Katniss feels when she kisses him makes the bond forged between them so much more believable. It shows the great development of emotions that spans across the two books, and it’s something that I support! Even the other side characters such as Finnick and Johanna were more developed. I really started to get into the character of Finnick just by the descriptions of his actions, the things that he did throughout the book. And, of course, Johanna was as perfectly standoffish as in the movie, but still an amazing character. Overall, I was once more extremely fond of the vivid descriptions – each slice of the arena that was described gave me a huge sense of how cruel the game masters were, how much so many of the people simply don’t care about the lives of the people in the arena. Even the heartfelt emotions of the people during their interviews… I can’t say enough about the descriptions of this book, though I don’t want to say too much on the off chance that someone hasn’t read it. Overall… love the book. I’d give it at least a 8/10 on the must read scale!